Historian Lara Vapnek talks about her biography of the great labor organizer and champion of civil liberties, Elizabeth Gurley Flynn. In 1906, 15-year old Elizabeth Gurley Flynn mounted a soapbox in Times Square to denounce capitalism and proclaim a new era for women’s freedom. She wowed the crowd and went on to become one of America’s most important leaders for workers’ rights. Beginning with the Wobblies and continuing with the Communist Party’s organizing of modern unions in the 1930’s, Flynn not only inspired the labor movement but also developed new ways of organizing that advanced its cause. She also was a tireless champion of free speech rights and other civil liberties. 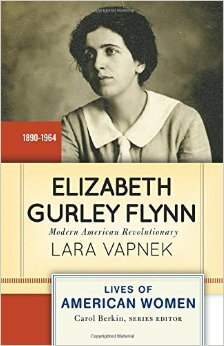 Historian Lara Vapnek’s biography, Elizabeth Gurley Flynn: Modern American Revolutionary, is part of the Lives of American Women’s Series of books out from Westview Press. Lara Vapnek is Associate Professor History at St. John’s University. She is also the author of Breadwinners: Working Women and Economic Independence, 1865-1920.